If you’ve never seen a bald eagle in the wild, then what are you waiting for? You don’t need to go to Alaska or the Great Lakes. Missouri is the winter home to thousands of bald eagles migrating from northern states. 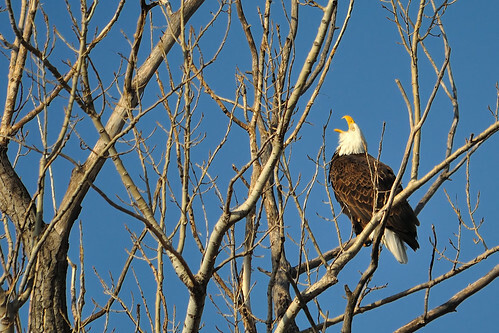 Open waterways for fishing and a taste for migrating waterfowl make our state a winter haven for eagles. Special activities and spotting scopes will be set up for your eagle viewing pleasure. See a live eagle up close presented by Dickerson Park Zoo on the hour Saturday 9 a.m. to 3 p.m. and Sunday 11 a.m. to 2 p.m.
Squaw Creek National Wildlife Refuge is located 90 miles north of Kansas City near Mound City, Mo. Find more information, including a map of the refuge, on the Squaw Creek Eagle Days flyer. Enjoy the opening of the Living Room display in the Conservatory at Powell Gardens, and then come discover who lives where in the bird world. Touch and hold a variety of bird boxes and nests and try to guess which birds nests where. Free bird box plans will be available, too. Plus, pick up information to participate in Project FeederWatch, a Cornell Lab of Ornithology program, and help us track the birds that frequent the feeders around Powell Gardens. No registration required. This is a self-guided discovery station with printed directions, so come at a time convenient for you. Take a trip out to Wyandotte County Lake Park for ther 12th annual Eagle Day event. Activities will be held at two locations around the lake. Two live eagle presentations by Operation Wildlife will take place at 10:00 and again at 1:30. Seating is limited; please come early. The library will also have eagle crafts for kids and binocular and field guide check out for viewing eagles and other waterfowl on the lake. Trained bird spotting volunteers will be available to help visitors find and identify birds near the library. Visit with volunteers from Operation Wildlife to see and learn about a variety (10-15) of live hawks, owls and falcons on display. They will give 30-45 minute bird presentations on every hour beginning at 10:00 (last one at 3:00.) You will be able to learn about the natural history of each bird. Great photo opportunities! For more information or to download a park map, please visit http://www.kckpl.org or call 913-299-2384. Feeding and watching birds is a wonderful way to introduce children to some of Missouri’s winter residents. In the craft session, children will make a milk carton into a functional and personalized bird feeder. All materials provided, plus each child will receive some seed to fill their feeder at home. Sunday, January 13, 1:00 – 4:00 p.m.
7300 SW West Park Rd. With the cold weather beginning to set in at last, birds are in need of plenty of extra calories to stay warm. This makes wintertime a perfect time to attract birds to your backyard. With a few simple tips, you can have them flocking to your feeders. Our Feathered Friends has several requirements for observing birds.